The library contains over 2000 volumes of books and family records of early Kentucky settlers that include Hardin, Nelson, Larue, Breckinridge, Meade, Grayson and Hart counties. 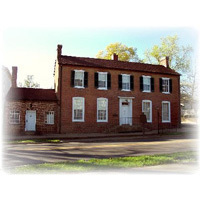 Among the resources are near complete collections of Hardin County, Kentucky records dating from 1793 to roughly 1930. These records include marriages, wills, tax lists, court orders, settlements records, deeds, censuses, cemetery inscriptions, family files, bible records, and other items of genealogical interest. Genealogical information is also available by way of mail for researchers unable to visit the library. A nominal fee is required. To learn more about this service please call 270-765-2515. Library fee is $5.00 per person/per day for research. 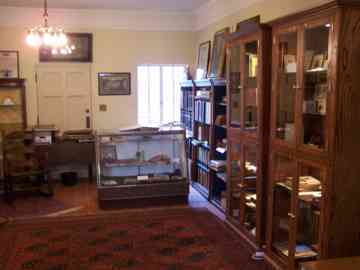 However, you can become a "Friend of the Brown-Pusey House" with an Individual Membership of $30.00, the member would have unlimited use of the library for a year. A Family Membership is available for $50.00 and also allows for unlimited use of the library for the member and two guests for a year.